Glider exercise machines can be one of two types. An air glider keeps your legs mostly straight as you move them back and forth. 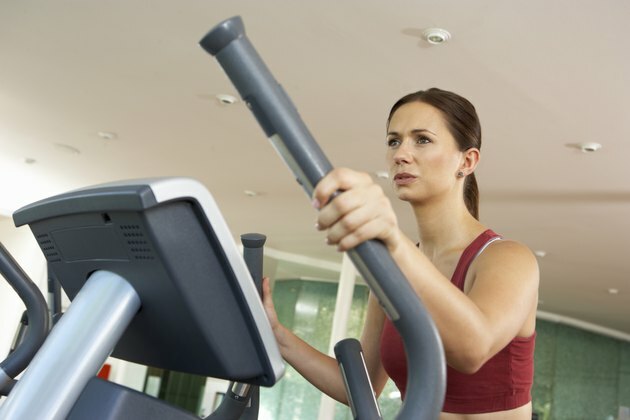 An elliptical machine bends and straightens your legs as you glide through the workout. Both gliders offer efficient cardiovascular workouts that burn calories, improve your heart-health and aid in weight loss. Your muscles are also stimulated as you exercise against the machine's resistance. Air glider machines are used for aerobic exercise. The large muscles of your legs perform the motion, which elevates your heart rate into your aerobic training zone. You control the pace on the gliders which speed up or slow down according to how fast you move your legs. This is different than using a treadmill when you have to keep up with the pace of the moving belt. On the glider, you can instantly adjust your pace to increase or decrease your workout intensity or easily perform aerobic intervals. To improve your cardiovascular system, use the air glider for a minimum of 10 consecutive minutes. An air glider is a weight-bearing activity because you stand on the platforms and support your body weight. Your feet remain on the platforms and at a position which prevents your knees from moving forward over your toes. This reduces the strain on your knees. Since you do not raise and lower your feet off the platforms, the exercise is low-impact and lessens the chance of injuries to your ankles, knees, hips and back. Your legs move forward and backward in a repetitive motion, but within your personal range of motion limits. You do not extend your hips beyond a comfortable point, which reduces the pull on the muscles of your hips. Your legs supply the power as you glide back and forth. Your hips flex and extend, which contracts your hip flexors and your glutes. When using the elliptical glider, your knees flex and bend, which contracts your hamstrings and quadriceps. On some of the air gliders, you have handlebars that you move back and forth to activate the muscles in your arms, such as your biceps and triceps. You also feel the contraction in your shoulders as you push and pull the handles. The movement during the gliding exercise is forward and backward, but you can also stand sideways on the air gliders and move your legs apart and together which challenges your inner thighs. This doesn't work on the elliptical glider, but the elliptical offers the option of gliding motion in reverse, similar to bicycling backward, which shifts a greater concentration to your hamstrings and glutes. One way to tell if air gliders offer good exercise is by evaluating the number of calories you burn during the workout. The number of calories is effected by your weight, the intensity level and workout duration. For example, if you weigh 150 pounds, you burn approximately 387 calories during 30 minutes on an elliptical glider. A person weighing 180 pounds burns approximately 464 calories for the same duration. You can expect to burn approximately the same amount while using a traditional air glider. Does the Air Climber Work for Losing Body Fat?